Here is the third installment about Joe Newton's and my skitrip up on the Finnmarksvidda, or Vidda, at the northernmost corner of Europe. It had snowed quite a bit during the night and the wind had created beautifully formed drifts where our tents had disrupted the flow of whiteness on whiteness. The morning was cold and fairly still, with good visibility. 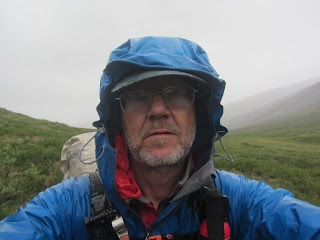 Being forced out of the tent around 5 o'clock in the morning by an insistent bowel movement, I soon weaseled back into the tent again. With a temperature of around -11 C, the wind chill factor made sure you did not spend too much time contemplating during potty breaks. Inside the tent the usual snow melting and breakfasting took a couple of hours, but then we were on skis again, heading in a south-easterly direction. We wanted to pick up the valley of the Vuoldávzi to use as a handrail, going pretty well straight south on this featureless, flat plateau qwned by snow and wind and with few visitors. We were beginning to get a hint of why. Visibility soon got worse, much worse. Not only did the wind increase again, stilll thankfully more or less at our backs. 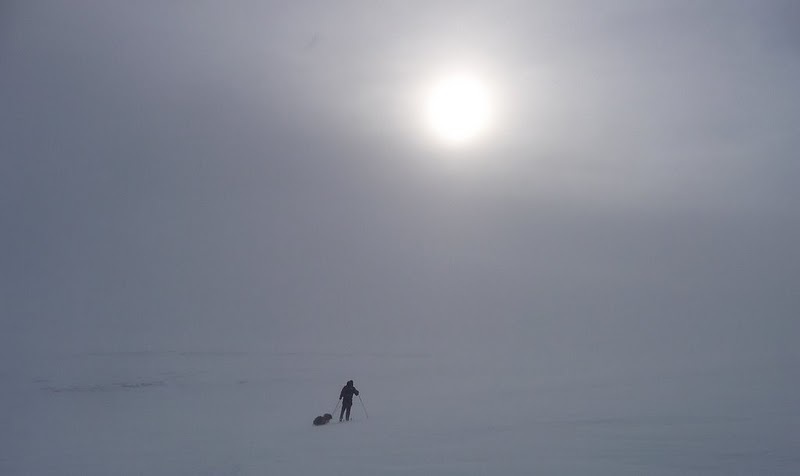 But clouds complemented the wind whipped snow and at times we only had the direction of the wind, on the back of our right shoulder, and the mildly shining disc of the sun straining throught the whiteness, to guide us onwards. We made pretty good time inspite of the poor conditions, but the white out got more and more impregnable to the eyw as the morning progressed. We found our hand rail valley alright and followed its shadowy presence in the distance, when we could discern it. At times not even the sun could penetrate the whiteness of the sky to give us a pinpoint of light to use as direction of our skiing. But we pressed on, using a compass and our general feel (which at times can lead you very wrong) for direction. Now and then the sun could be glimpsed and give us corrections. The whiteout made it increasingly difficult to see gradients in the snow in front of our skis. It was difficult to see if the ground was slooping up or down. 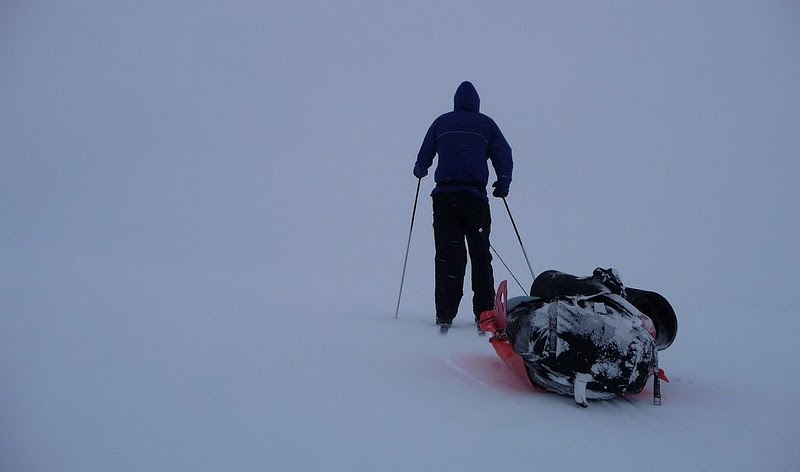 Or to see if the snow was collected in soft drifts or if it was sastrugi, hardened by the wind and with not much grip for our steel edged skis. Around the middle of the day the whiteout was total in the direction we were heading, south and towards the sun. To the east we could glimpse our handrail valley, petering out. We were aiming for a lake where the valley and our handrail river had its source, that was where we wanted to cross this particular watershed on our way to Kautokeino. Close to that lake, as far as we could judge in the difficult circumstances, we saw a reindeer fence on the other side of our handrail, this now receeding and pretty shallow valley. Thefence was also on the map, and a kink in its straight line not far a away would give us a welcome GPS fix and a definite position on which to build our continued navigation. The area between where we were standing and the fence seemed to be just a slight dip in the snow, a couple of hundred meters down would lead us to the fence and we would be over the watershed. However, on the map we could see that the valley still showed fairly steep walls in the general area where we were, and knowing the deceptiveness of this snow and light we started down the slight incline towards the beckoning fence with care. I was in the lead, enjoying the fact that gravity made my skis slide easily downhill, something we had not seen much of so far on this trip. But I took care, not wanting to ski out on and fall down a crumbling corniche, which could easily hide itself in the featureless whiteness. It was not a corniche but a crevasse that suddenly manifested itself, not far in front of my skis. Looking to the left, north from were we came, I could make out a deep, narrow twisting gully looking like a crevasse in a glacier. Not my favourite spot for a picknick. To the right, south where we were going, I could see absolutely nothing. Everything was white with silvery trimmings. I carefully made a 90 degree turn and started south, hoping to follow the crevasse to a point were it petered out and allowed us to cross. Contrast and visibility was nil, as I skied carefully forward. 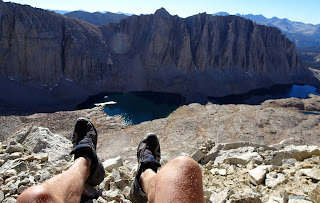 Looking back over my left shoulder, however, I could dimly make out the crevasse. It came slithering after us like deadly silent white snake. Inching closer it seemed. Taking a close look at this scary feature both Joe and I realized that this was not something we would risk to chance that we could follow in these blinded conditions. We carefully started inching our way back up the slight incline we had just come down, hoping to distance ourselves from the scary maw in the snow by moving at what we hoped was a 90 degree direction from were the silver serpent was moving. Back up out of the slight hollow we felt safer again, but visibility was still zero in the direction which we were going, and it was midday. We decided to take a lunch break and pitched our tents. For me procedures were the same as the day before. Soaking socks and soaking/frozen boots off. Dry socks on and wrap the feet in a quilt. Hot water bottle to thaw the toes out. In the relative peace of the tent I could also dig out all our 50 K maps and take a look at terrain and distances. Not cheerful, considering this was our third day, not counting the first afternoon. We only had three full days and this half-day to our disposal and were not even a third of the distance to Kautokeino. After lunch I called Joe over to my tent and we looked at the hard evidence. With the whiteout making it more or less impossible to see where we were going and the knowledge that none of us could stay longer than Tuesday next week due to our work commitments, the decision was logical. We had to leave Kautokeino for another time and get out of our present situation some other way. As usual when it came to route finding we reasoned along the same lines, came to the same conclusions and were of the same mind. This certainly made us strong team. However, getting off the Vidda did not look any easier than getting onto it. One thing was certain, none of us had any wish to go down the way we came; down the hillside from hell. So what other alternatives did we have. East of us ran highway 93 from Alta to Kaoutokeino. The distance was only 20 kilometers as the bird flies. However, not being birds, we would have to negotiate not only the valley that had proved a hinder only half an hour ago. On the other side of this valley, towards highway 93, was also the much bigger, deeper and steeper valley of Vesterelven, one of the bigger tributaries of the mighty Alta river. Chances were, that lacking local knowledge, we could get bogged down on any number of hillsides from any number of hells getting into and out of that valley. Looking at the maps we saw only one route that looked attractive, although it brought no cheers to our lips. It meant backtracking, passing this mornings camp anew, and then heading in a generally northerly direction. Following a more modest-looking river valley would then bring us to a small road, that would bring us to bigger road that would bring us to highway 93 pretty close to Alta. There we ought to be able to hitch a ride or call a cab. One huge disadvantage, but one that had to be managed, would be that we would now be heading more or less straight into the hard wind. Something that is very much different from going with such a wind at our backs. 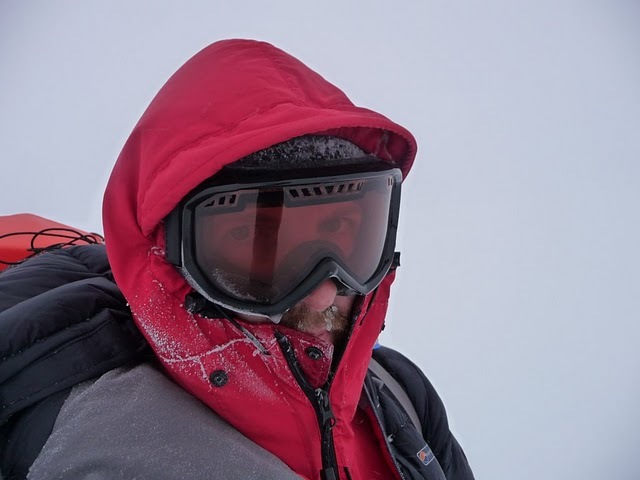 At temperatures around -10 C and winds around 15 meters per second that we were experiencing, the wind chill factor on our faces would be equal to -30 C weather without wind. We would have to bundle up and take care, watching noses and cheeks carefully. Said and done, we bundled up and headed back north. After a while it became clear that Joe was the better lead dog, having less trouble than me at guesstimating where our handrail valley was (now on our right hand side) in the intermittent whiteout and whipping snow. Taking the lead he soon developed interesting icicles protruding from his face and googles. I could relax in the slipstream behind him, simply concentrating on never letting the back of his skis slip away from me. "Voss, Voss, Voss...". Later Joe said that this was a mental low for him, but he sure hid it well and it did not affect his performance. We simply bullied our way north, against the wind and the snow. Later going to the airport in Alta, we heard from the taxi driver that the airport and all roads in the area had been closed that Friday, due to the harsh weather conditions. So we were not the only ones having a hard time that day. Thankfully, few things keep you warmer than vigourous exercise, and we were well clothed and warm in our mitts and parkas, with only small portions of our faces exposed to the winddriven snow. Checking these portions every now and then against frostbite we made surprisingly good time going north and when it was time to camp we had proceeded quite a bit north from our last camp. 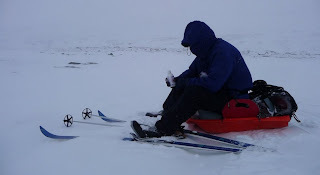 In fact, a GPS check later that night showed we were closer (as the bird flies) to our first camp in the Mattis Valley. The wind was decreasing as the hours passed and when time came to set up camp the weather was quite manageable, I'm guessing at 8-10 meters per second, and visibility was among the better for several days. After having eaten I ventured briefly outside to fill my bag with fresh snow to melt in the morning. Coming back into the tent and getting things organised for the night, I realized there was one thing missing. Real Turmat freeze-dried foods are mostly excellent. The new Oriental Casserole can be recommended. These pouches that you fill with boiling water and let cure for 5-10 minutes are also useful for other purposes. I find these bags, when empty, to be excellent pee bags at times when you do not want to venture outside your tent. You pee in them and then close the ziploc, leaving you a closed bag that can be put in a corner of the tent, ready to empty when convenient. Well, my aim had been to empty the pee bag when sticking my head out to collect snow. But I had forgotten, and now the pee bag was nowhere to be seen. Now, as everyone having looked everywhere for something in a tent, and still not found it knows, there is only one place left where it can be. Yes; under you. The impressively flat pee bag was resting tranquilly in a pool of pee underneath my closed cell foam pad. Fortunately, the lumpy snow surface underneath the silnylon tent floor had managed to keep it reasonably contained in a small hollow. Since snow is excellent at soaking up moisture I grabbed handfulls from my snowbag and could soon dump a load of soaking, yellow putty outside the tent leaving a mostly dry floor. The tent served me well for the rest of the trip, but stunk to high heavens when we hung it up to dry at the motel in Alta. By popular demand it was relegated to the porch outside the motel. Lesson learned: Avod going where you cannot see. Avoid sitting on your pee bag. Great idea to have separate acounts of the trip but did you really have to make it a serial? I don't ski, have never been further north than Newcastle in the UK, but now I really want to! This is an epic adventure. Thank you for sharing. Both yours and Joe's accounts make great reading. I'm really glad google reader recommended your blogs. Glad you enjoy our blogs. And I do not ski much either, I just walk on skis. If you keep it up long enough it car take you far.. Very nice reading again. It makes me want to go up north, back to the winter. I will also try to remember the second lesson. Another great episode in the saga, Jorgen. Looking forward to tomorrow's.